The gallery on the Galaxy S4 Active has a new layout. It can be sorted into albums, all photos and videos, time, location, etc. There's also a spiral option, which revamps the gallery into a Scalado-like spiral of images and video, which after a while gets really nauseating. You can pinch to zoom in the gallery and thus manage the size of the thumbnails (two or three thumbnails per row). Air view lets you hover your finger above and image and you'll get a bigger thumbnail overview of the image or you can use it to peek inside folders. Upon choosing an album (for instance Camera) you're taken into that albums' stack of photos but a swipe to the right will reveal a bar on the left with the albums. In this mode you can browse images in a dual-screen mode. You can easily retouch photos right in the Gallery itself. The photo editor gives you options like crop, rotate, color and effects. You can also make a memo on top of the picture. The Gallery also supports highly customizable slideshows with several effects to choose from, customizable music and speed. You can also highlight specific images to be included in the slideshow. There's a nifty detect text option in the Gallery's context menu, which does as advertised - it detects text on an image and converts it into a text file, which you can share via mail, messages, etc. Keep in mind that it requires a data connection to work. The My Files app hasn't changed really - it is an efficient and simple to use file manager. It can move, copy, lock and rename files in bulk, even send multiple files to another phone. My files will only browse the memory card and the large internal storage (it can't access the system drive). The TouchWiz music player on the Galaxy S4 Active is jam-packed with features and supports a wide variety of file formats, including FLAC, Wave, etc. Music is sorted by the usual Artist, Album, Playlist, etc. but there's also Folder support, which is quite handy as it saves you the need to sort songs into playlists like on so many other players. There are more tabs available - you can hide or show tabs from the Settings menu. Then there's Music square - it's quite similar to the SensMe feature of Sony smartphones. It automatically rates a song as exciting or calm, passionate or joyful and plots those songs on a square (hence the name). The Samsung Galaxy S4 Active can also search for content on third party players like PCs on the same network. Samsung has enabled equalizer presets (including a custom one with 7 bands) along with the sound-enhancing SoundAlive technology, which features 7.1 channel virtualization. Samsung uses SoundAlive in some of their MP3 and Android-powered media players. The Now playing screen gives you the usual options - a timescroll of the song, play/pause and back/forth controls, repeat and shuffle, volume control but it also adds lyrics support, AllShare shortcut and a direct sound settings shortcut. While listening to a song you can find music controls in the notification area and the lockscreen. 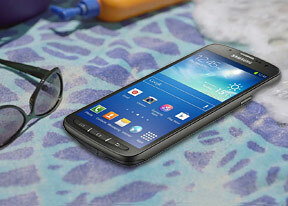 The Galaxy S4 Active has a couple of features that will improve your listening experience further. One is Smart Volume, which equalizes the volume between tracks. The other is Adapt Sound - it plays a series of beeps (both high and low frequency) and asking if you can hear them. This way the phone can map the capacities of your specific headset and fine-tune its output for optimal sonic experience. After the calibration is complete, the Galaxy S4 Active plays you a demo of the kind of gain you're receiving by keeping Adapt Sound on. The best video player found on smartphones just got better. The new video player, found on the Samsung Galaxy S4 Active has the last watched video on top for quick access. Under it there are three tabs - personal (showing you the videos on your local storage), Download (which lets into the Videos store) and Nearby devices, which shows the PCs and players on your local Wi-Fi network. The grid view is our favorite as it is a true quad-core tour de force - the visible video thumbnails are actually playing the videos instead of being static images. They play at a reduced framerate and generating those previews takes a couple of minutes the first time around, but it's an awesome preview and it shows what can be done when you have processing power to spare. The video player lets you choose between three crop modes for how the video fits the screen. The same SoundAlive audio-enhancing technology is available here too. The video player lets you squeeze the best viewing experience out of the large, high-res screen. You can adjust video brightness, color tone and enable outdoor visibility too. The chapter preview detects chapters in the video and shows a rectangular grid, with live thumbnails (just like the grid view above). Hovering your finger over the timescroll lets you preview part of the video in a small thumbnail - just like YouTube videos do when you hover the mouse. Pop up play is here too - it moves the video in a small floating window and you can use other apps on the phone while still watching the video. You can use pinch zoom to adjust the size of the video. The Samsung Galaxy S4 Active offered a list of subtitles and let us pick. It scans for all subtitles, so the file doesn't have to have the same name as the video file. The Galaxy S4 Active managed to play all files we threw at it. DivX and XviD along with MP4, AVI and MKV were no problem for the Galaxy S4 Active and there were no issues with the audio codecs either - not even the usually problematic AC3 videos caused any trouble. 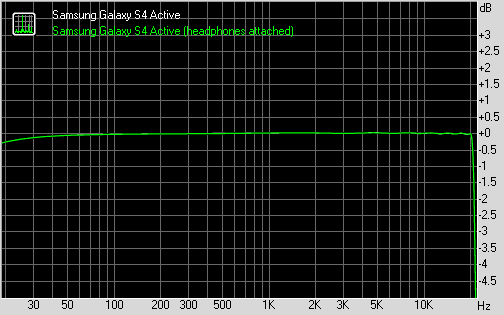 The Samsung Galaxy S4 Active did greatly in our audio quality test. We can't really say we are surprised as it matches the output of the two regular Galaxy S4 versions and we already know those to be some of the nicest sounding smartphones around. The Samsung I9295 Galaxy S4 Active had absolutely flawless output when connected to an active external amplifier, producing excellent scores all over the field. Its volume levels aren't the highest we have seen, but it should just just fine for 99% of the occasions. Impressively enough, there's next to no degradation when you plug in a pair of headphones. Save for the barely detectable (in the lab, let alone with a naked ear) hike in stereo crosstalk the output remains perfect. A really solid showing by the rugged droid here.